Sunday was the latest battle in Philadelphia vs. RunnerTeal. 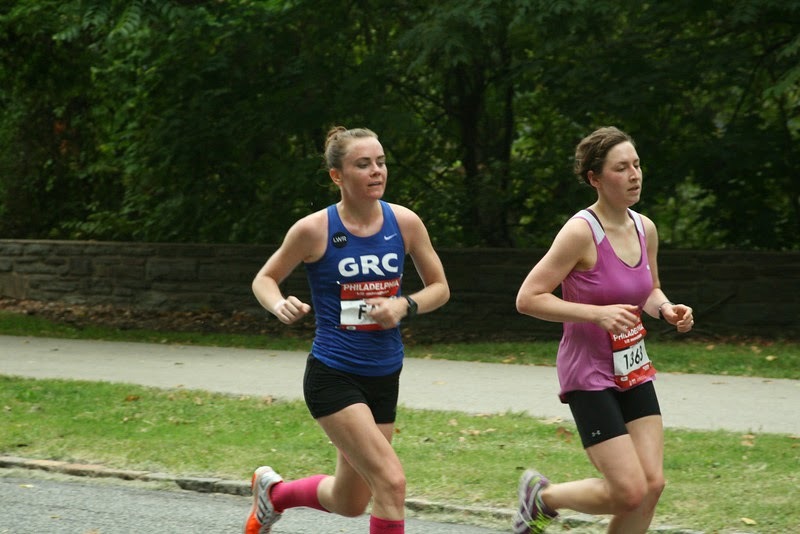 I was taking on the Rock-n-Roll half and—for once in Philly—I wanted a win. Even a loosely defined one. The best part of the day was when Kara Goucher spoke to me. In the elite area before the race, I was standing behind her in the porta-potty line. The race coordinators were yelling about how we all needed to get to the start, but the line wasn’t budging. Kara turned to me and asked, “Can’t we just pee behind the porta-potties?” I tried to say something helpful, but instead made a useless nervous giggle/noise. She disregarded my pathetic-ness, hopped out of line, checked out the situation, and—deciding it was a least semi-private—announced to the line, “Yea, I’m going to make this a thing.” Apparently, Kara Goucher is quite humble about where she pees. (Although, in stressed moments before a race, aren’t all runners?) Post-race, I had the chance to redeem my lack of skills interacting with running celebrities when Deena Kastor came up beside me at the dessert table. I wanted to ask, “How did you do, Deena?” as I hadn’t yet heard if she had broken the Master’s World Record. (She had.) Instead, I stood there pathetically and watched her eagerly select a mini-cupcake (red velvet, for those wondering). The fact that the best part of the day was a pee-related incident with my idol says something. The day did not go well. but you can play Find My New Best Friend in the background. After Kara and I became fast friends, we headed to the starting line. As I stood in the corral, bopping around to the music to stay loose, watching all the spectators snap photos of the elites, I thought, “You know, this is pretty awesome.” And not just because someone decided (incorrectly, as it turned out) that I was worthy to stand at the front. The start of any race is awesome. The music is going, the city streets are cleared just for us runners, spectators are out to repeatedly tell us we are awesome. I was reminded of what Mary Wittenberg says at the start of the NYC Marathon: “The city awaits you.” Sounds pretty sweet, let’s go. So go we did. And then it got decidedly not awesome. My very loose “plan” was to go out at 6:15 pace for the first five miles and then see how I felt. If I was in good shape, I’d pick it up from there. If not, that’s okay, it’s early in the season; I’d just try to maintain. I hit a fast first mile and a slow second one, but by 4 miles I was pretty much right on my planned pace. Mile 5, though, was way too slow and I could tell picking it up was not an option. In fact, dropping out entirely seemed much more probable. I debated this for much of the next mile. Again, it was a replay of the last time I raced here. (Why do I keep reliving races?) Dropping out around mile 5 is the ideal giving up spot; you’ve just looped back by the start/finish area and can easily duck out and pretend today never happened. But I realized that dropping out was not so ideal (obviously!) because not only would I have given up on the race, I also would have given up on a solid workout for the day. In my world, all things revolve around the marathon, and being in terrible shape for a half marathon does not give you license to do nothing. The marathon looms, and it’s Sunday Runday so you better do something. I gave up on the race, but tried to salvage the day. I’d keep on plugging along and take it as a workout. Mile 7. Enjoying having a cheering squad/paparazzi to help me through the "workout". The fact that I was no longer racing relaxed me only slightly, I was still upset as to what terrible shape I was in. My splits edging closer to--and becoming slower than--marathon pace didn’t help. (I’m hoping to run a marathon faster than my average pace from Sunday, so, even as a marathon pace workout, it wasn’t great.) My time was embarrassing (“Um, who invited this girl to the elite area?? She is not worthy to pee anywhere near Kara.”) and I wish I could erase the whole day. Sadly, I can’t. 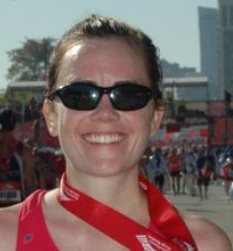 It was humid, but I’m pretty sick of making excuses. There will be other chances, I hope (although perhaps not to tell Deena that red velvet is always a good choice). A few other runners enjoying their race/workout/Schuylkill stroll. Next time, Philly. 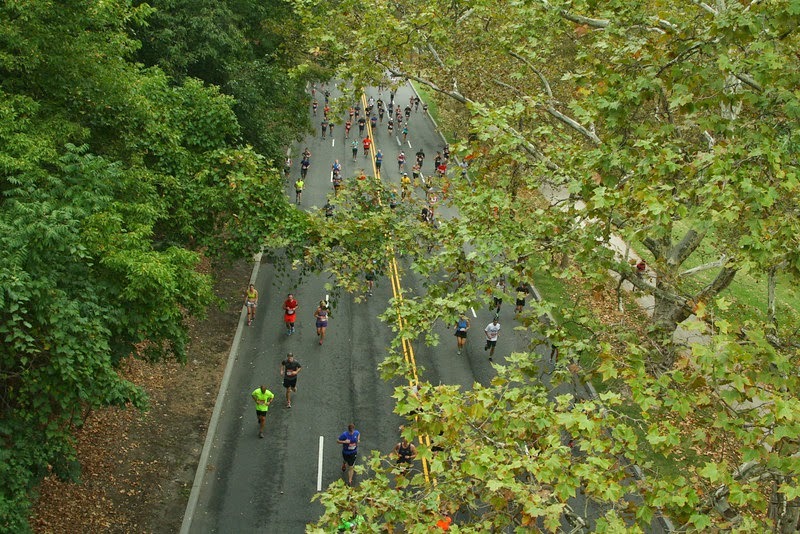 This weekend, I take on the first of the season’s races: the Rock-n-Roll Philadelphia Half Marathon. Unfortunately, I don’t have such a great track record in Philly. I’ve bonked, I’ve lost, I’ve not even started. Six attempts to run in this city. Six different disappointments. What’s the deal, Philly? 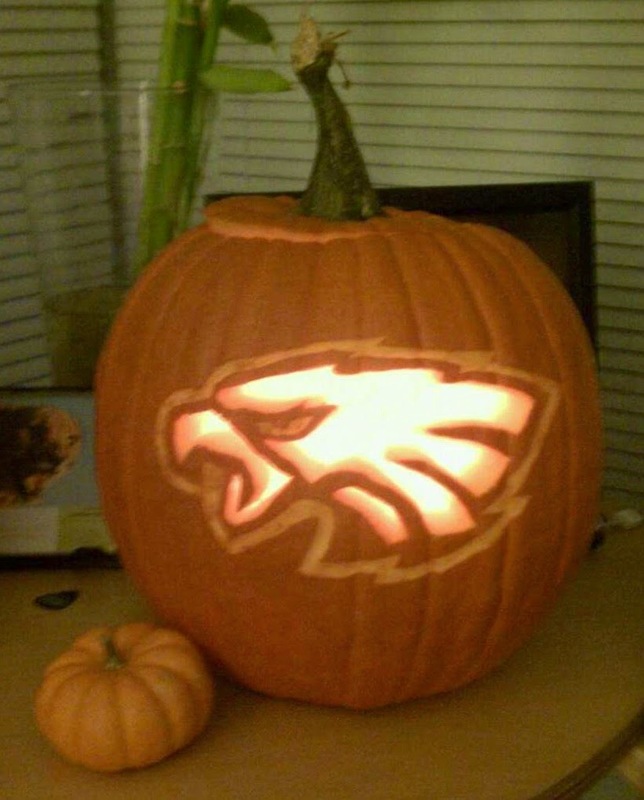 I grew up not far from you, I’ve got family in the area, I even carved a pumpkin in your honor. Can’t you cut a South Jersey girl some slack? C'mon, Philly. Return the love. When I signed up this year, at the beginning of the season, I had high hopes for reversing this Philly curse. The beginning of the season is always a clean slate. Anything is possible. The calendar of races stretches out ahead like a perfectly crafted path of potential PRs; it might as well be full of rainbows and candy, there for the taking. From Candy Cane Forest and Gum Drop Mountain all the way to the Candy Castle, it’s the Candy Land board of races. Everything will go perfectly! I will be faster than ever! PRs all around! But then, you know, reality sets in. I had a couple of weeks where things were clicking; I was getting stronger and faster. Then I hit a rough patch (the Molasses Swamp?). I felt sluggish, had a couple of bad workouts, my hip tightened. My body needed a break so I gave it one. I took my scheduled recovery week even easier than planned, and by the following week my body felt 100% better. But the damage to my head—to my confidence—was done. I don’t feel like I have the workouts under my belt just yet to really kill it at Philly. It is still early in the season, so maybe that’s okay. Maybe no Candy Cane Forest just yet. I'd be happy to just run comfortably strong for the whole race and not implode in the second half like I’ve done often lately, and always when in the City of Brotherly Love. I don’t really know what that will turn out to be, pace-wise and time-wise. The plan—or lack of one—is to try to ease into it, see how I feel, and try to pick it up in the second half. Hopefully the sluggishness of a few weeks ago is truly gone. If I can just run a strong, solid race, I feel like I'll break this curse. 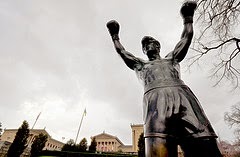 And I'll raise my arms in victory (however small) when I get back to the Art Museum, Rocky style. You know what they say: the seventh time’s a charm... ?